Today was it, our last and final day of a busy week at MHI’s ProMat 2015. Easily the largest material handling event in the US, ProMat draws close to 40,000 people to Chicago’s McCormick Place for its mega biannual trade show and conference. This year was no exception – the Mallard booth was buzzing from day one. A big area of interest for manufacturers and distributors alike was high-density, case-pick applications. Challenged with a proliferation of SKUs and space constraints, they looked for options that would both maximize space and create a productive order picking station. Pallet flow does just that – case selection from the front pallet position with easily accessible, dense reserve storage located directly behind the pick line. There’s just one downside with traditional systems which is the back pressure exerted by the weight of the rear pallets. Back pressure is 6% of the combined weight of the rear load. Here’s an example. 5-deep system with 2,500 loads. Back pressure = .06 x 2,500 lbs. x 4 pallets (5 deep less empty first pallet) = 600 lbs. 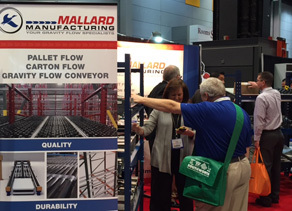 We shared this easy, affordable back pressure solution with our ProMat visitors – Mallard’s Latching Separator. 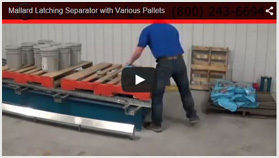 The pallet separator holds and locks all rear pallets at a comfortable 6″- 12″ behind the first pallet, removing all forces. The order selector can safely remove the empty pallet. Once back in order picking position, he or she can lift the manual pallet release latch to gently flow the 2nd pallet into position. All remaining pallets are again locked in place behind until engaged for release. We use floor mounted H-supports vs. traditional pallet rack to support our pallet flow systems with latching separators. This creates easier access to all cases for picking and better access to flooring beneath the rails for clean-up. H-supports are available at custom heights depending on load size. Call Mallard’s gravity flow specialists for more details, design advice or a free quote.